Chaos: making a new science. 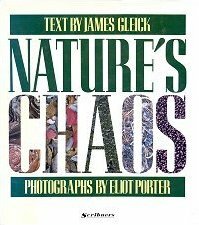 Nature's Chaos: making a new science. Genius: Richard Feynman and modern physics. It doesn't seem to me that this fantastically marvelous universe, this tremendous range of time and space and different kinds of animals, and all the different planets, and all these atoms with all their motions, and so on, all this complicated thing can merely be a stage so that God can watch human beings struggle for good and evil-which is the view that religion has. The stage is too big for the drama. Religion meant superstition: reincarnation, miracles, virgin birth. It re-placed ignorance and doubt with certainty and faith; Feynman was happy to embrace ignorance and doubt. Faster: the acceleration of just about everything. The world really is getting faster. We are cramming more and more into our lives. We are impatient with wasted time: we push the "close" button in lifts, we squeeze in another activity while the microwave oven cooks our food in record time, TV companies edit pauses and compress speech to speed up interviews and chat shows. Gleick documents the increasingly frenetic pace of our lives, and includes various anecdotes that are gloriously funny, because of the self-recognition. Unlike many decrying the increasing pace of modern life and calling for a return to simpler, gentler times, Gleick explains that we actually enjoy this faster pace, and are adapting to it -- the younger generation a little more successfully than the older. What Just Happened: a chronicle from the information frontier. The Information: a history, a theory, a flood. For thousands of years, no one wondered what would happen if we could travel through time. Until, at the turn of the last century in a lamp-lit room, a young H.G. Wells, working on his first novel, married the words ‘time’ and ‘travel’ and changed our perception of the world for ever. Now our finest science writer takes us on a mind-bending tour of the idea The Time Machine introduced, as it infiltrated contemporary culture – from Marcel Proust to Doctor Who, Jorge Luis Borges, Woody Allen, pulp fiction to modern physics.